It's that time of year again! It's Global Running Day today. How far did you run? 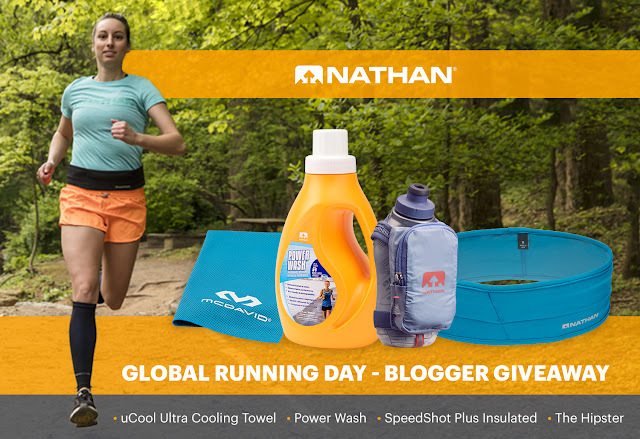 Last year Nathan did a giveaway for Global Running Day and they are doing it again this year. I received some awesome products to test out and tell you about. Check them out below! First up is the Nathan Speedshot Plus. This is a handy 12 oz water bottle. I've been using this for the past six months and it's fantastic for short runs and races. The top is soft to the touch and has a nice zipper pocket for keys or gel. You can even get your iPhone 7 in there if that is all you put in it. Nathan upgraded the bottle this year to give it more grip too. 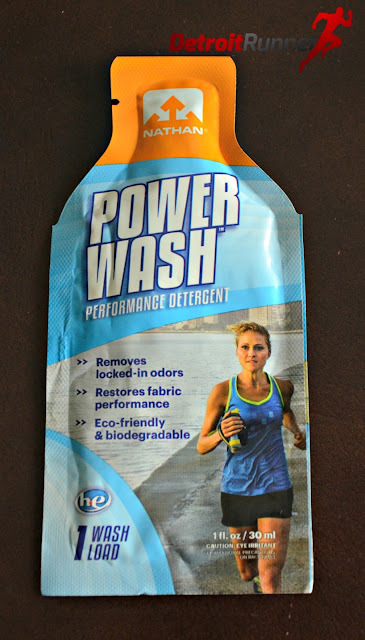 I use mine at least 4 times a week and its showing no wear and you can also throw it in the wash with your other running stuff. Speaking of wash, Nathan also included some packets of Power Wash. This is detergent that is especially formulated to get the odors out of your running clothes. I know we all have had that smell we just can't get out. Give this a try! Next is the McDavid Ucool Ultra Cooling Towel. Just wet it and the towel automatically becomes up to 30 degrees cooler than the average body temperature. I like it because it's large - 15 x 35 and you can easily throw it in the wash after use. This will come in very handy when the temperatures start rising this summer or for those of you in warmer climates all year. It's really soft and comfortable unlike some products I have seen like this. Finally Nathan provided The Hipster. This is a running belt that allows you to carry your phone (up to an iPhone 6 plus). I only have the iPhone 7 but this belt got a ton of uses over the last six months. The belt sits close to your body so it does not move around. I can't even tell it's there most of the time until I need to use my phone. I have found best results by having the phone in front of me so it's very convenient. It's been a great tool to allow me to take pictures while on my runs in the morning. I have to say that it's the most comfortable running belt I've worn and I've tried plenty. So who would like to win this great package? Good luck everyone! I will post a winner one week from today! Disclosure: I receive each of these products in exchange for this blog post. All opinions are my own and I was not required to give a particular opinion other than an honest one.